For Junior Engineer (Civil) : Diploma in Civil Engineering from an institute identified through the Government. For Junior Engineer (Electrical) : Diploma in Electrical Engineering from an institute identified by means of the Government. For Hostel Warden (Female) : Graduation from a identified University & 3 years experience as Assistant. Age Limit : Maximum & Minimum age restrict is sixty five years to fifty five years for Junior Engineer (Civil/ Electrical) & forty years to 50 years for Hostel Warden. Junior Assistant - Passed 10 +2 examination from a Board or its equivalent recognised by the Govt. Diploma / Certificate in Computer Applications Operations latest softwares i.e. MS Office (Word / Excel / PowerPoint) and proficiency in computer operations. For Multi Tasking Staff - Matriculation or equivalent pass. OR ITI Pass. Selection Process - Selection will Be Made on through Written Test & Skill Test. A Demand Draft/ Bankers cheque should be drawn in favor of NIFT Delhi” payable at Delhi. How to Apply - Interested Candidates may apply in prescribed application form along with attested copies of relevant documents & Fee to the The Joint Director, National Institute of Fashion Technology, NIFT Delhi Campus, Hauz Khas, Near Gulmohar Park New Delhi-110016 – 670562 on or before 10.03.2017. 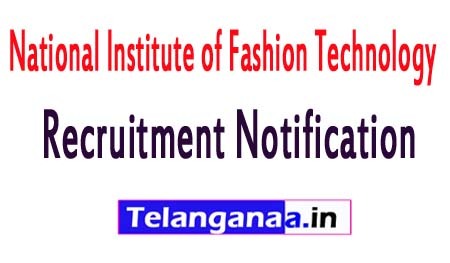 National Institute of Fashion Technology (NIFT) Jodhpur invites Application for the post of 08 Junior Assistant, Lab Assistant & Various Vacancies on Contract basis. Apply before 20 February 2017. For Junior Assistant - Passed 10 +2 examination from a Board or its equivalent recognised by the Govt. Diploma / Certificate in Computer Applications Operations latest softwares i.e. MS Office (Word / Excel / PowerPoint) and proficiency in computer operations. For Lab Assistant : Full time Diploma in relevant engineering. A Demand Draft/ Bankers cheque should be drawn in favor of NIFT , payable at Jodhpur. How to Apply - Interested Candidates may apply in prescribed Application form along with self Attested copies of certificates and testimonials in proof of age/educational qualifications/ caste/experience etc. send to the Deputy Director, National institute of Fashion Technology, Karwar, Jodhpur-342037 on or before 20.02.2017.